Cold weather calls for comfort food and what better wholesome meal idea than the Casserole or Stew. Chicken Casseroles and Stews are warm and satisfying and the recipes are quite easy. "Vibrant Winter Cooking With Comforting Casseroles & Sensational Stews." I've seen a bit of debate on other cooking forums about the difference between a casserole and a stew. A simple explaination is that a casserole is cooked in the oven and a stew is cooked on the stove top. Most people seem satisfied with the explaination that a stew is a dish that is prepared by stewing - profound I know... Stewing is a method of cooking by which food is barely covered with liquid and simmered slowly for a long period of time in a tightly covered pot. The result is tender meat and great flavours in a thick soup-like broth from the stewing process. A casserole refers to the method of cooking and the dish in which it's cooked and served. To make a Casserole is extremely convenient because the ingredients are "en casserole" which is French for "cooked and served in the same dish". A "casserole dish" (French for "stew pan") usually refers to a deep, round, ovenproof container with handles and a tight-fitting lid. It can be glass, metal, ceramic or any other heatproof material. 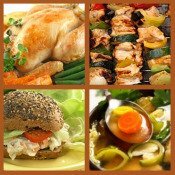 If you like French cooking, Easy French Food is a fantasitic website where the easy French recipes are designed with today's busy cook in mind. Kim has a collection of Delicious Stew Recipes that are sure to warm you up. Varying forms of "casserole" and "stew" are found around the world. In South Africa (where I am from), the Potjie is one of our traditional stews. In some parts of America, a Casserole is known as a Hot dish. I've tried a fair number of chicken casseroles and then adjusted the seasoning and ingredients to suit my taste. I have listed my favourites below, please feel free to try them out. Rice goes very well with chicken stews and casseroles. Here are some guidleines on how to cook rice perfectly. Mashed Potato is another great comfort food to go with a chicken stew - try this Mashed Potato Recipe.